You are not logged in. 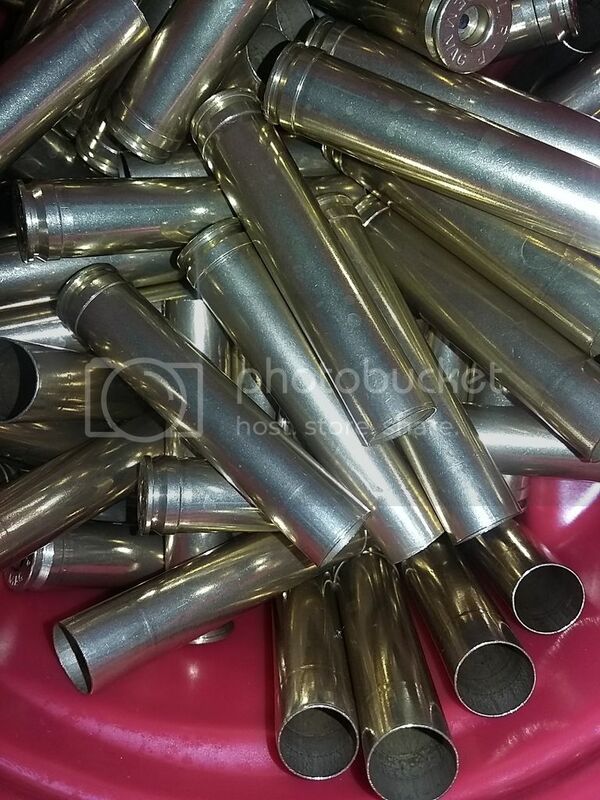 [Log In] VaGunTrader, LLC » Forums » Reloading » Reloading - Rifle Loads » Fire forming belted magnum brass to load .340 Weatherby or .458WM subsonic loads. 27 registered (Silby, Big_Country, Pdrou, Ryan84, .45 Shocker, graustin, Schebishzt, SNN, wwood11, Kevin_C, Tomahawk58, OXN, Crhenderson, MrPepper, Steady, Mike1899, Stircrazy186, Dave1978, Otislee, 8 invisible), 11 Guests and 7 Spiders online. 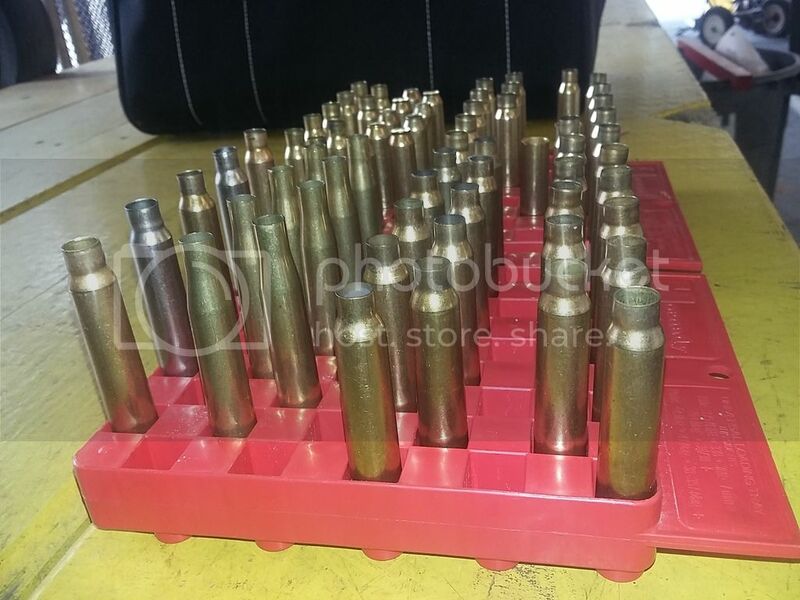 #1155149 - 02/08/17 09:48 AM Fire forming belted magnum brass to load .340 Weatherby or .458WM subsonic loads. With the exception of .378, .416 and .460 Weatherby... all belted magnum brass uses .300 H&H as the original parent case... at least to the best of my knowledge. My goal is to convert odd lot brass I have to brass I can use. H&H brass will be fire formed to .340 Weatherby... all others will be used to load 730 gr. .458 pills in a .458WM. I will not share specific charges (lots in internet opinions out there... simply Google "fire forming with Cream of Wheat"). I will say that I am using a much lighter charge than many... and still tweeking that charge. I am using Clays powder and whatever primers I happen to have the most of. Not that important. 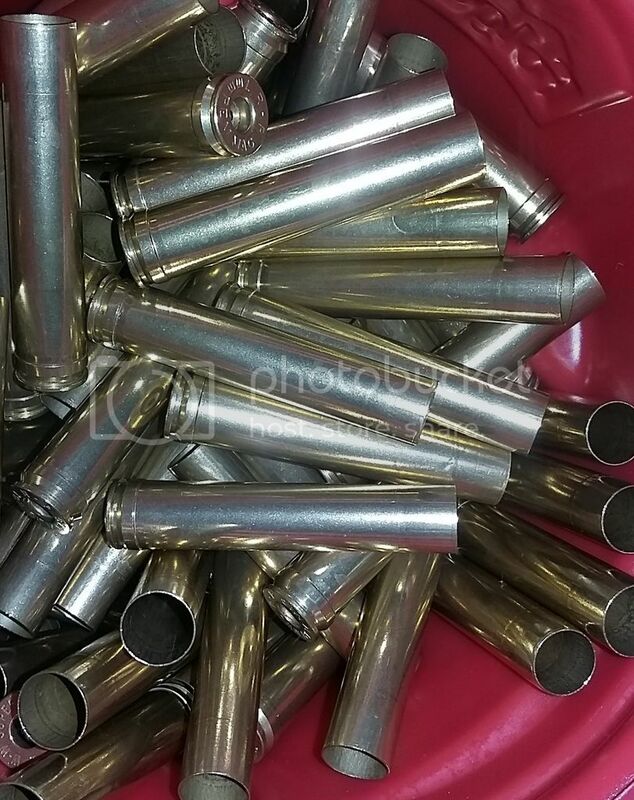 Prime brass, charge with a light load of a fast pistol powder, add Cream of Wheat or old used walnut tumbling media (small scoop full), stuff/pack a 1/2 sheet of toilet paper on the top and shoot in a .340 Weatherby, .458 WM. Neck expanding and removing neck (sawing it off) has been tried. Seems to help mitigate splitting. See 3rd and 4th row in the back of pic). Cream of Wheat or old used walnut tumbling media (small scoop full) may not be necessary... Testing just primer, powder and toilet paper method as well. 2-9-2017 EDIT... THIS DOES NOT WORK WITH A LIGHT CHARGE!!! Will try again with a heavy charge. Below are the pills I am loading. 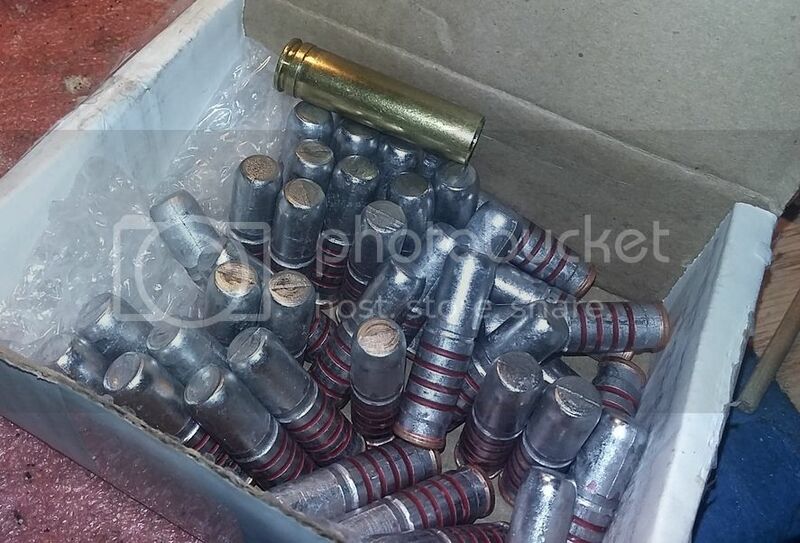 About 1.7" long (.45 acp brass for scale). Cartridge overall length will matter, but seating depth is irrelevant (i.e. 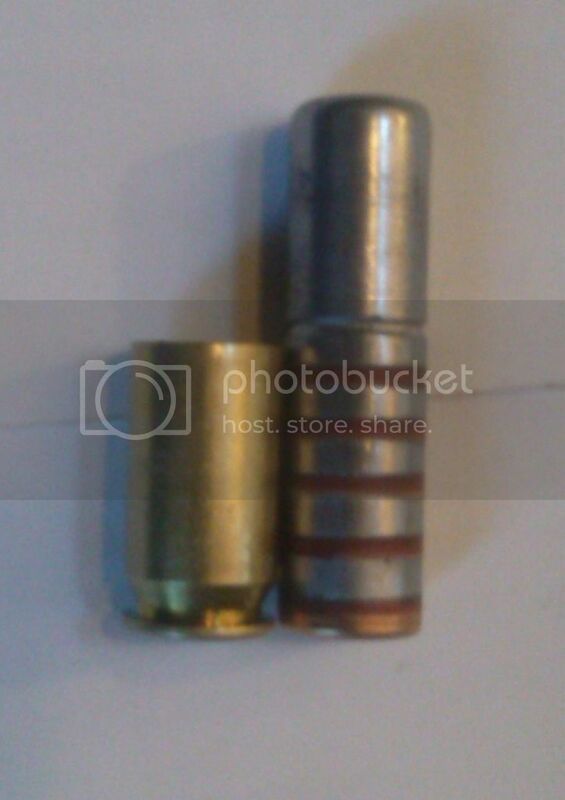 any brass length from 1.8" to 2.5" will work with these pills in a .458 WM or .458 Lott). Think breech seating (like the big guns by US Navy), although this is actually case seating and not breech seating). Trim (below splits (if splits are present)) and load. I may also try a mini chop saw like many folks use for a .300 Blackout case fabrication from .223. I will post pictures of this once I get it completed. As well as a video/audio of 730 gr. pills being launched (with a can). FYI... I have already fired these pills in a .45-70 with a .458 Lane can. They are VERY VERY VERY quiet. Impact is HUGE. Can of Copenhagen for scale. Why abandon the .45-70? The powder column is too short (or at least VERY short) after the pill is seated 1.1"... plus I happen to own a 1:10 twist .458WM. 1:10 should stabilize these 2 ounce fishing weights very well. IMHO... The name of the game in subsonic is to launch the biggest projectile possible below the supersonic crack. This is the goal of this project. Sub MOA accuracy is secondary. Edits and more pictures to follow. 7mm to 458 Lott may be too much. Exactly... that was the 18 or 20 grain recipe I read about on the internet. I have backed off from that quite a bit, but still having some splits... tweeking my recipe further... almost there. Edit... Please save that brass for me... I am going to try some something fun... see if we can convert that pup to run in an AR-10!!! This is some .300 H&H that I converted to .340 Weatherby yesterday. Five on the left vs. five on the right. 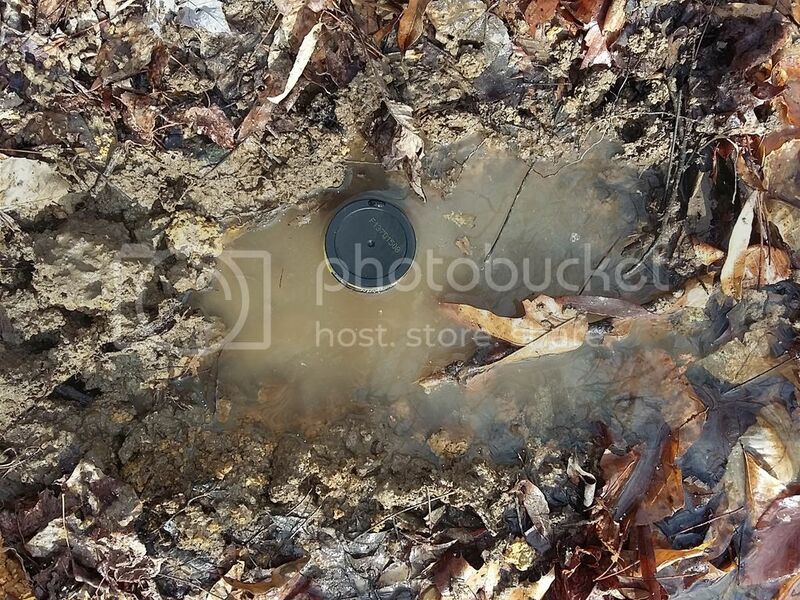 FYI, I learned that because .300 H&H has a tapered chamber, debris can fall in the chamber (from the previous fire form) and when the next round is fire formed the debris will stick the case in the chamber. Easy enough to tap out with a rod, but still leaves Cream Of Wheat dimples. Have you tried annealing the area of the neck you are fireforming prior to converting? I'm about to build a DIY case annealer, they can be made for about 100 bucks, way cheaper than a $500 Giraud. My plan was to use it on my 510 to soften the brass where I am cutting a neck into. This is the projectile I am loading. The final product is powdercoated. I have friends with DIY annealers. I plan to use them on some other calibers for sure. The concept/purpose is great... thanks for the input. Is that 1,006.7 Grains? If so, I am indeed beyond impressed. So... loaded some 730 pills last night for both the .45-70 and the .458 WM. Very light powder charge with Dacron pillow buffer above the powder. This project is all about throwing 730 gr. fishing weights very quietly. 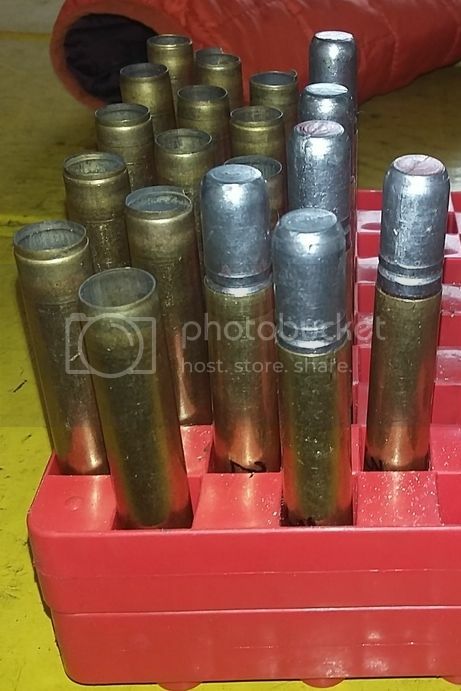 .458 WM loads... Case lengths are wildly inconsistent (but not critical). 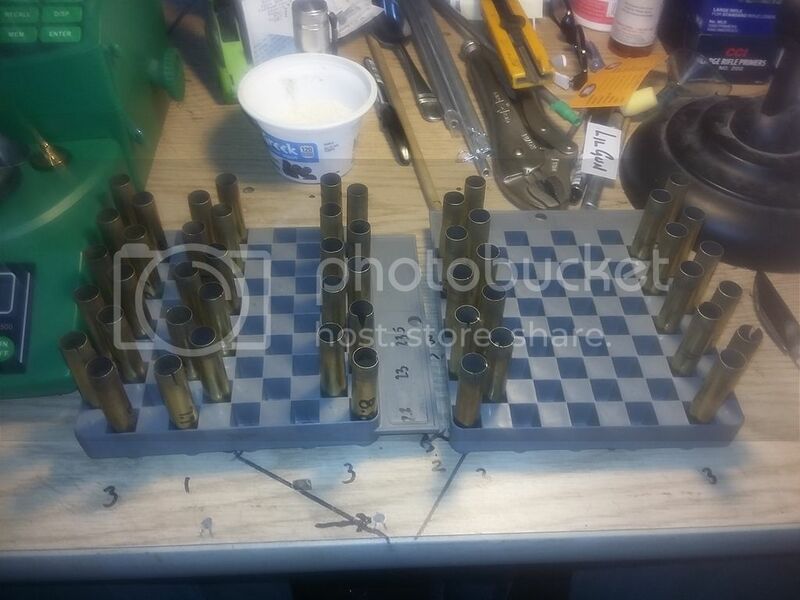 7mm RM brass and other brass used. COAL 3.04" and 3.14" for testing. A .458 WM is chambered at 2.5"... a .458 Lott is chambered at 2.75". Bullet jump on big stuff like this allegedly DOES NOT harm accuracy. We will see. What percentage case fills are you using and what powders? I've been hovering around 40-50% case fill in my project, utilizing WC820 or Accurate #9 Powder. I don't use any filler in mine. I have some Accurate 1680 I may also try along with some trail boss. I load subsonic 500 grains in my Beowulf SBR AR, and have successfully made it cycle suppressed with those. I'll be playing around with those 1000+ grain projectiles this weekend. I run them through a Bowers Vers 50 can. Seems like a lot of wind noise going down range when fired, but overall it just sounds like a car door slam. I sure love powder coated projectiles. My PC method adds about .002 per coat. Sure does keep the barrel clean, and the inside of the can has absolutely no leading. I can't get into powder type just yet... Still testing and naming it might imply a recipe, but 30 grains (probably TOO MUCH) is 0.6" of the available powder column... thus the buffer. I am not using any of the powders you mentioned. Pressure spike and sticking a pill caused me to go with a slower powder... plus my test barrels are 25" (.45-70) and 24" (.458WM)... probably very different than yours. I am running 1 grain ladders 18-30 gr. in .the .458WM (will stop when it gets loud) and 17 to 22 in the .45-70. Twist on the .45-70s is about twice that and thus will probably not stabilize, but may still be functionally accurate. 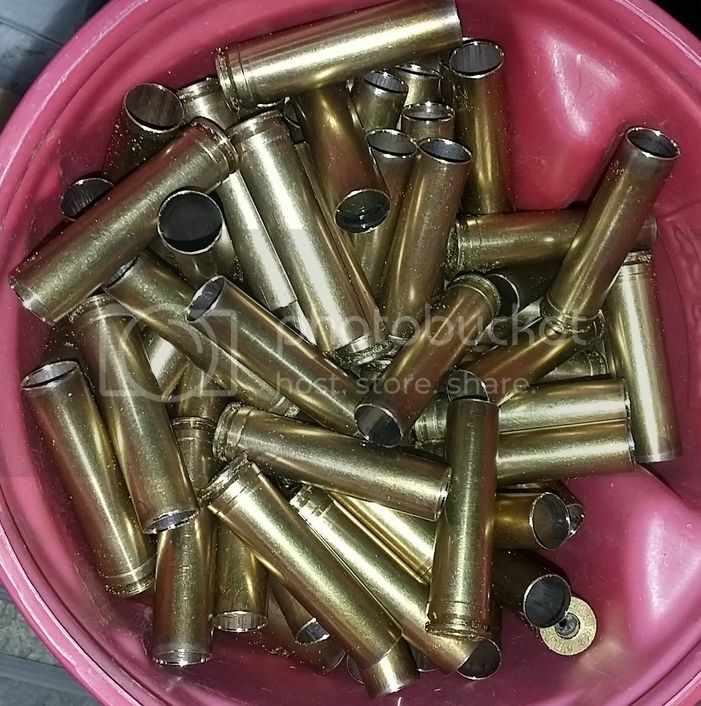 What is the case on your 1000 grain pills? They are .501s or .510s? 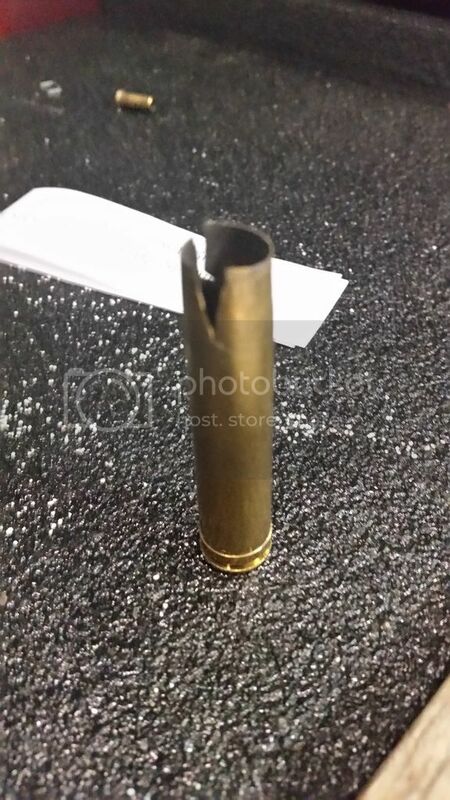 No optics on the .458WM (had to change recoil lugs (had her 0.002 too tight). Optics back on today. CVA Scout 45-70. Twist may not stabilize (Not sure yet). P.S. Yes I need a haircut. Took care of that yesterday. My barrel is currently 17.1" and is a 1:10" twist, and my projectiles are sized .512. 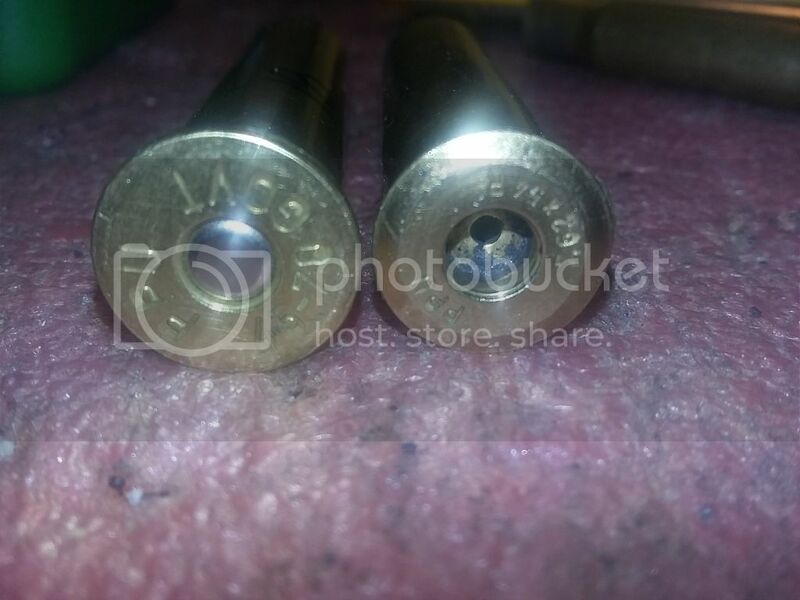 My groove diameter slugs out at .510, so I'm still playing with bullet sizing. I ran a bunch last weekend, and crono'd at 1040fps, still doing some more tweaking. 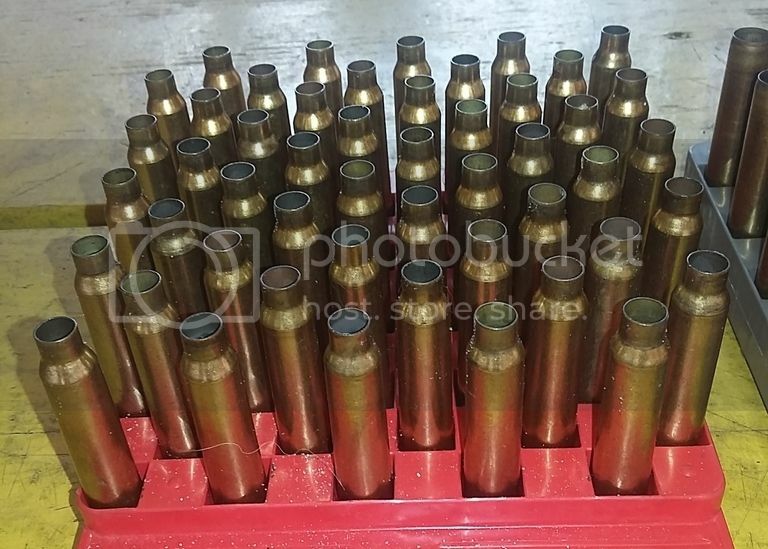 I am putting these in a cut down 338 lapua mag case, which has the first .445" neck turned down to 0.013" to make a shoulder. It's a major pita to make cases, but they should last a long time due to my load being way under the design pressure for 338LM. Your tests seem pretty darn quiet. It'd be cool to hear the impact against some steel. Let's meet at Tug's (or Nick's???) in a few weeks... get someone to donate an old Pinto and have a contest to see you can knock the door off first? Just kidding Tug/Nick... no junk cars on your property. I am doing some more load testing tomorrow. May also try some pills with rounded points for a lever .45-70. I own a Bowers 50 myself... a good can for .510s, but the .570 exit may be be allowing excess noise for your .510 Phantom... not sure. I am running a Lane .458... and may get Cory lane to make me a XL .458 (Magnum Scorpion body) bored out for .458. It would be almost as long as the Bowers. I am having a ton of fun with my projects... also working on an AR-10 version with the same load data. I am very impressed with what you are doing. I'd be up for that challenge! I have plenty of lead/projectiles, just brass limited as it takes a while to make each piece with all the neck turning. Attached is my current host. Once I get this and a couple other projects complete, the next one I want to do is a lever gun. I'd love to try and get something like this in a semi, the heavy lead cast are only 3.075" long, but if I load 690 FMJ they grow to 3.34", and the 750 Amax are just under 3.6". Loads from 16 grains to... (40 grains (Lott ONLY!!!) of XYZ powder. - The powder column on both .45-70 and .458WM is the same (or at least close enough to negate). - Twist rate DOES effect the charge that is needed to launch. 15-20% more powder was needed to achieve the same speed in the 1:10 twist barrel vs. 1:20. - Using buffer material in the powder column is critical to prevent flashover. - Both the Bowers and Lane cans work to render the shot very very very quiet. IMHO the Lane can is better/smaller/slightly more quiet (exit hole is smaller). Neither can took a baffle strike while testing. - 730 grain pills need speed to stabilize EVEN WITH A 1:10 BARREL. The speed needed will NOT be sub-sonic. - Keyholing happened alot yesterday... there may be a particular node/charge that is both subsonic and non keyholing, but I am not there yet... BUT do have a range that looked promising. - Groups were NOT GOOD... Painted a few 1" groups (50 yards) and then the 3rd or 4th shot was 12"+ off. 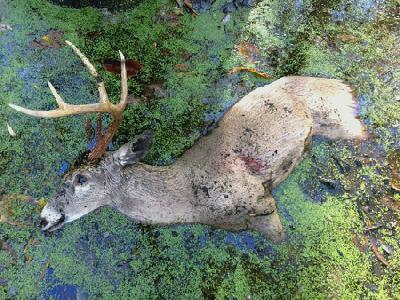 My guess is that the first two or three shots stabilized and the next ones might have slipped the L&Gs on a hot barrel. I am still sorting out this and other stuff tested. - .458 Lott 730 grain loads (full power for a .458 WM and 85% for a Lott) fly very well and hit with genuine authority, but are probably more recoil that most could stand to shoot @ 10+ rounds. 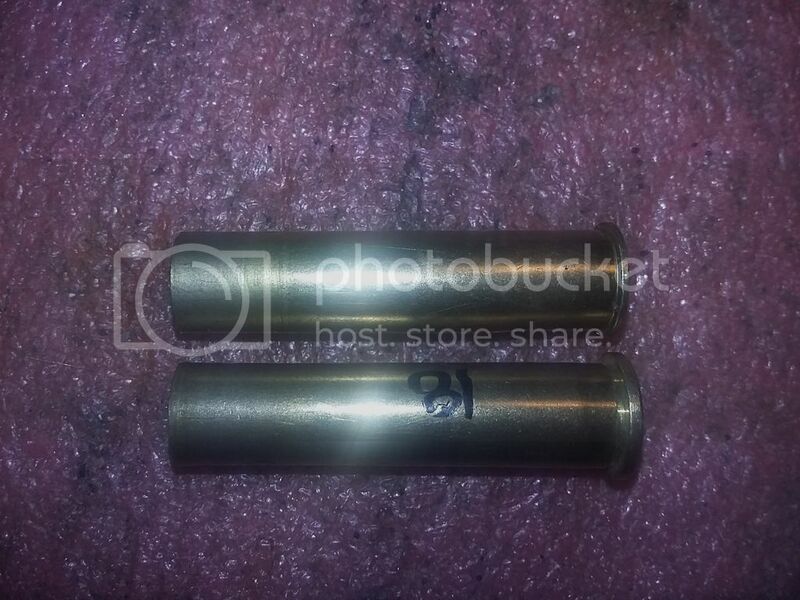 - The same pill with a subsonic powder charge is very mild to shoot (I would let my 12 year old son shoot this load)... kinda 20 gauge shotgun load. - Of course I could get off of the 730 grain insanity train and load 500 grain pills and paint dots, but where is the fun in that. - If I was to start over on the .458WM... I would make it 1:12 or 1:14 twist. While the 1:10 is a great twist for heavy fast .458WM... subs are simply far more fun. Final note... Also tried a very weird one... fire forming .45-70 brass from Mosin Nagant brass and COW... It worked BEAUTIFULLY!!!... 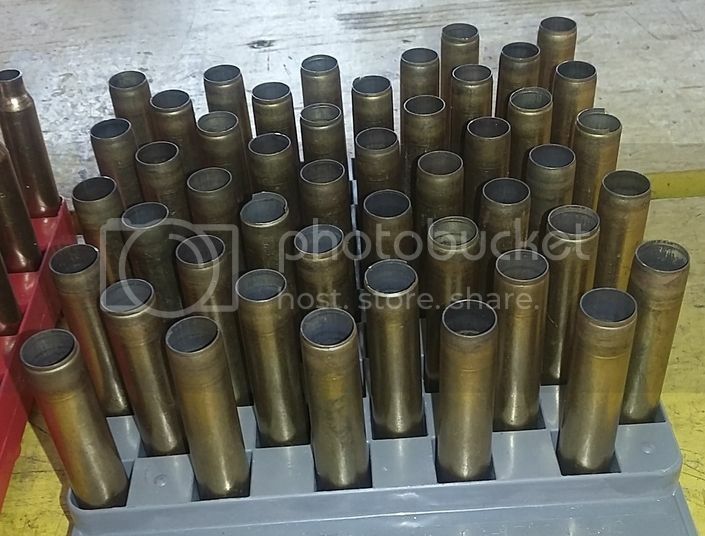 so I am looking for boxer primed 7.63/7.62 x 54R brass as well. Well I bit the bullet, and bought V3.9 of QuickLOAD. I'll see if it helps me with my big subsonic load development, and may be able to offer some predictions for things you want to try. It should be here in a couple of weeks, and I'll need a couple of weeks with it to validate its predictions against known velocities of loads I've already tested. I run all my stuff though a chrono, and have tracked powder charge vs velocity with bullet seating depth, powder type, and bullet weight/profile as my constants. Very cool... Congrats on that choice. I will comm with you by PM on my data (not public)... and see if we can help each other. I ran my stuff thru a friend's version of QL and it said my gun would blow up (thus the ratchet strap to the bench in my very early testing). 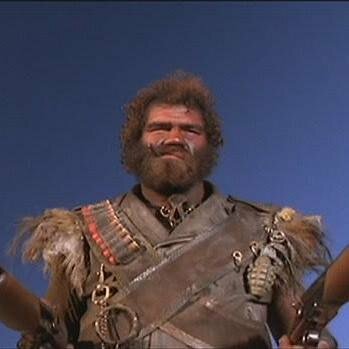 Guns are fine. Loads ended up being 100% safe... even mild (i.e. NO pressure signs on primers... a few of the .45-70 brass have stretched, but only on the very high end (non subsonic loads). QL is best for "normal" stuff... I think it gets a bit wonky for extreme stuff. i.e. 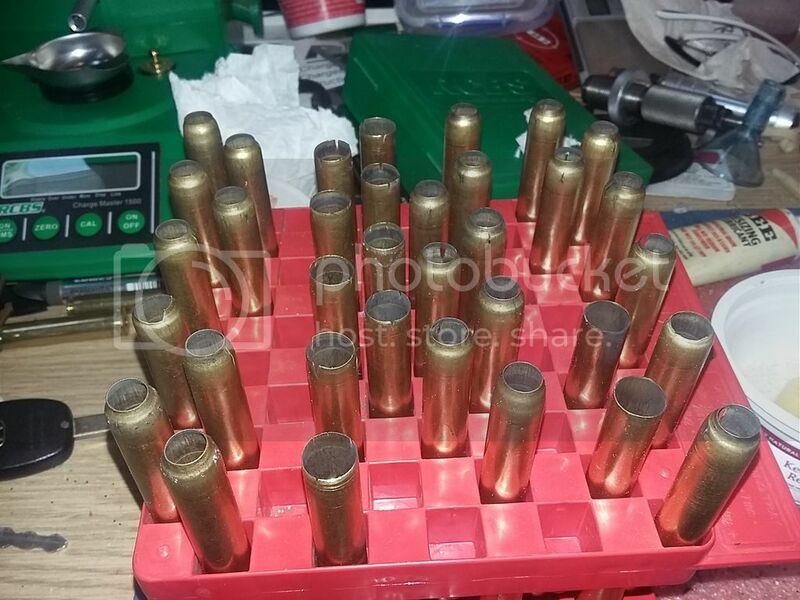 Working on 300 and 325 grain pills from my .460Rowland carbine yesterday (subs) and had lots of weird numbers initially... did find a few to try in the end though. I run all my stuff though a chrono, and have tracked powder charge vs velocity with bullet seating depth, powder type, and bullet weight/profile as my constants. I know other madmen are out there (not just DJ, MeQuirky and myself)... don't be shy, jump right on in with your project... we will all try and help each other. No project too goofy and no question too stupid, just look at my nonsense. I am working on an AR-10 version of my stuff (730 grain subs from an AR-10 could be fun)... worthless beyond 100 yards (maybe 50 yards), but still fun. Belts are my #1 safety check for headspace. I love belts. Also trying some puny 555 grain pills to see if that fixes the stability problem. FYI... IMHO the 730 grain pill can not be "calculated" by a tradition bullet stability method. MeQuirky is one of the smartest reloading guys I know. We chatted about this. The bullet is so freakishly different in design and crosssection... it is my belief that real testing will be better than computer models (unless someone (like TFB)) has a super program. I also believe my 1:10 and 1:20 twists are both fighting the hell out of me. My best guess is that a 1:16 twist would be best... if I had to do all over again. Back from the range... they are flying better (more stable), but are walking bad as the barrel/can heats. Load is 1,080+ FPS in a 1:20 twist 25" single shot barrel. #5 started to keyhole... this is going to have to be a cold barrel test from here on out. 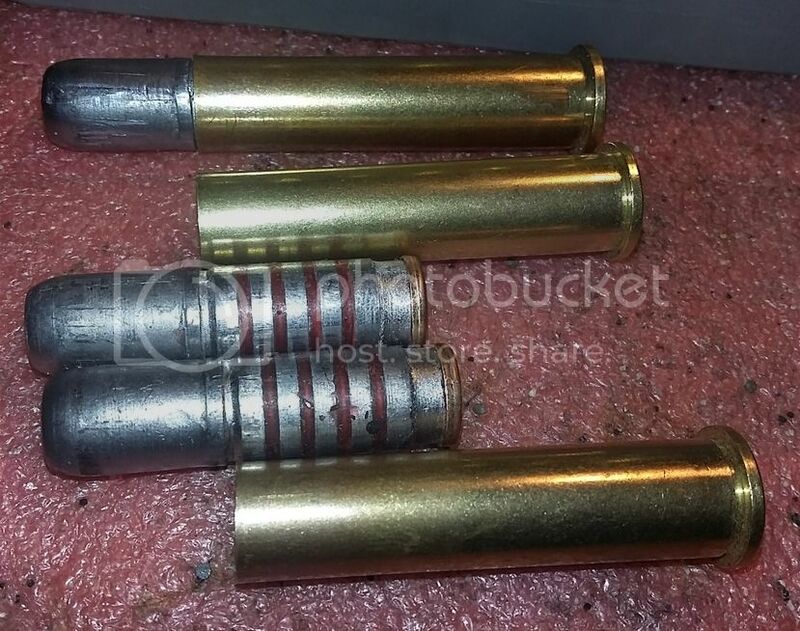 7mm brass is being fire formed into a variant of .458WM. Perfecting Cream of Wheat load now to mitigate splits. Cases that split will be cut down to 2.1" and used in a AR-10 in .458 that I am working on. FYI... LilGun is NOT the powder I am using to FF. Video of how quiet in very early testing... 730 grain projectiles. Brass (formerly 7mm RM) is now G2G as .458WM (for subs). .458 American (pretty much a .45-70) from an AR-10 that I am building now. Oh well... we all learn from our mistakes.